Like many who go backpacking, I pack bars - chocolate, cereal (or Müsli as we say in German) and variations thereof - for the time between breakfast and dinner. Usually I don't bother with lunch, as I am too busy walking and taking photos, so my bars need to give me enough energy to walk for six to eight hours. So as the dedicate UL backpacker I am, I sat down, took the weight of the bars, listed their calories and fat and made a chart of it. Calories are in kilojoule (kJ). 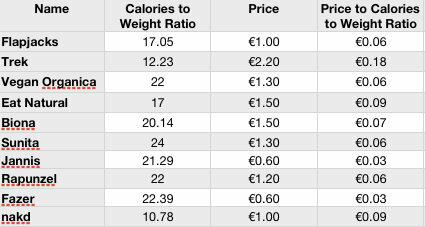 The most important column for you to look at is the "Calories to Weight Ratio" column, here I simply divided the calories of each bar by its weight (including packaging, I didn't want to eat ten bars in one go). The higher this number, the better, as it means you get more calories per gram carried. There are some differences, though. The Biona, Fazer and Vegan Organica bars are chocolate bars, thus will give you pretty much an instant boost of energy, but not for long. If you need the energy divided over a longer amount of time, you might want to grab a Flapjack, Eat Natural, Suunita, Jannis or Rapunzel bar. And then you got the nakd and Trek bars, who are at the lower end of the calories to weight ratio, but have more of that energy which will go into your system over time. The smaller the number in the "Price to Calories to Weight Ratio" column, the better. The clear winners here are the Fazer chocolate bar and the Jannis Sesame with Honey bar, who both are 0,60€. While the Sunita bars are the clear winners if it comes to calories to weight, they are double the price of one Jannis bar, so I usually take the Jannis, who are also very tasty. Speaking of taste, you will see that there's a lot of coconut there, I really like coco so it is usually what I like to take along for a trip. But there's a wide variety of different flavours available for most of the listed bars, so you likely would find something to suit your taste (I like them all, otherwise I wouldn't buy them). And besides the Fazer and Jannis bar, all others are either Fair Trade, Vegan, Soil Association or similar approved, so you can snack with a good conscience. Here a list of links to the websites of the manufacturers, often with the possibility to order a box of the bars, as well as some subjective comments from me about the taste. Worth to check out, especially for the UK readers (somehow a whole bunch of those companies are from the UK!). Flapjacks: They're like a meal, seriously. I often can only eat half of them in one go, so these are basically for me two bars in one. Tasty and in a lot of different flavours. Trek: Good but expensive, at least here in Finland. Given their low calories to weight ratio score, I probably won't buy these anymore. Vegan Organica: I love these. I carry one for every day I go out with me, and savour every bite. Eat Natural: Very nice and fruity, with many different flavours. Biona: Another one of those awesome coconut bars. I usually take the Vegan Organica ones though, as they're a bit cheaper. Sunita: I like Sesame, its very tasty, and if you're looking for the most calories per gram, this is your go-to bar. Jannis: Cheap and tasty, I usually always have one per day with me. Rapunzel: Great energy provider, good taste. Fazer: From Finland, many different, great flavours, cheap, and tasty quick energy. nakd: They're good, but otherwise they have a low energy to weight ratio and are expensive. Probably not going to buy these again. Yeps, I hope this was also an interesting excursion for you, and helped you to see where you might be able to save weight in the food department. Taking lightweight, high calorie bars for the trail is the way to go in my opinion. We often fuss around how we can save 100 g for our tarp by taking it in Cuben, when cheap and easy savings can be made with very basic items like these presented here. I hope it inspires you to have a look at the food you carry!